San Juan to Chilecito, Argentina 563km including 353km timed Special Stage Juan Pedrero Garcia was the surprise winner of stage four of the 2014 Dakar riding a factory Samsung Sherco 450 SR. The 35 year old Spaniard finished fifth overall riding a factory KTM in 2013 but his victory today marked his first ever Dakar stage win and Sherco’s second. Pedrero outpaced Chilean Francisco Lopez by just 29s and as a result of the stage win moves up to 16th in the overall standings. For Lopez it was another excellent result for him and KTM that sees him third in the overall standings just 5m 12s off the lead. Fellow factory KTM man Marc Coma was also a big winner today. He finished third on the stage and closed the gap to race leader Joan Barreda to just 3m 10s. For Barreda who has already won two stages of this years race, it was a significantly less successful day finishing 6th 13m56s off the lead. Another big loser today was five time Dakar winner Cyril Despres. The Frenchman looked on top form on stage three, but lost a massive 42m 09s today and as a result slips to sixth overall and is now 41m 17s adrift of the overall lead. He said: Yesterday went great, it was one of the most beautiful specials I've ever done. Our strategy called for taking my team-mate Michael Metge's wheel this morning because it was in better condition. Everything went well until km 170, but then we started to make small navigation mistakes, but we managed to stay on top of things with Marc (Coma). We were both there with 150 km to go, but 9 km before the end, my Iritrack support broke down and damaged the wires. The motorcycle ground to a halt and I worked hard until I found the problem: a short-circuit. Do I look disheartened? Well, I'm not. We've just finished stage 4 out of 13. The day I give up is the day I should pack up and go home. True, it's a big setback, but I love this race, and I know it's not over until it's over. I could have given up today, but I'm still here. The motorcycle doesn't miss a beat, and I'm in tip-top shape." But while Despres is still in the race, Britain’s Sam Sunderland is out of the Dakar after suffering an engine failure before the start of the timed Special Stage. It’s a bitter blow for the 24 year old factory Honda rider who became the first Brit for nearly 16 years to win a stage of the Dakar when he dominated stage two of this year’s race. 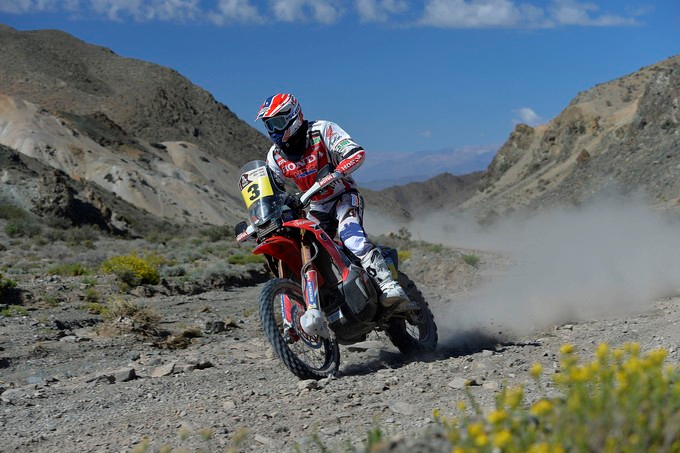 At time of writing the sole British rider left in the Dakar is Paul Jay was yet to finish the stage but had been clocked at check point 3 in 80th position. Jay is entered in the Malle Moto class which means unlike the vast majority of his rivals he is allowed no outside assistance and has to carry out all the maintenance on his bike himself – making his achievements to date all the more impressive.